Mediterranean taste with only one pot to worry about. Heat dressing in large deep nonstick skillet on medium heat. Add chicken; sprinkle with oregano. Cook 5 min., stirring once. Add vegetables and broth; simmer 5 min. Stir in rice; cover. Simmer 5 min. Turn off heat. Let stand, covered, 5 min. or until liquid is absorbed. Grate 1 tsp. lemon peel; sprinkle over chicken. Cut lemon into 4 wedges and serve with chicken and rice mixture, if desired. 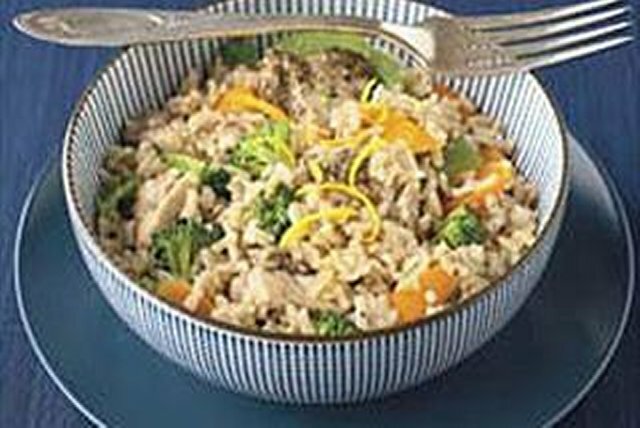 In this easy meal, the broccoli, carrots and peppers team up to provide an excellent source of vitamins A & C.